Identification: Upperside of male is yellow-orange with a wide brown border and a large squarish black stigma. 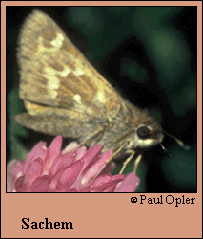 Female upperside varies from yellow-brown to very dark brown, but always has a square transparent white spot at the end of the forewing cell. Underside of female hindwing is brown with nearly square cream or white spots. Caterpillar hosts: Grasses including Bermuda grass (Cynodon dactylon), crabgrass (Digitaria), St. Augustine grass (Stenotaphrum secundatum), and goosegrass (Eleusine). Adult food: Nectar from many flowers including swamp and common milkweeds, buttonbush, dogbane, peppermint, red clover, tickseed sunflower, thistles, New York ironweed, marigold, and asters.